As of this writing, no local media outlet has reported on this. A newly published report (dated October 6, 2011) by British magazine Times Higher Education indicate that no Philippine higher education institution made it to the list of top 400 universities in the world for 2011. 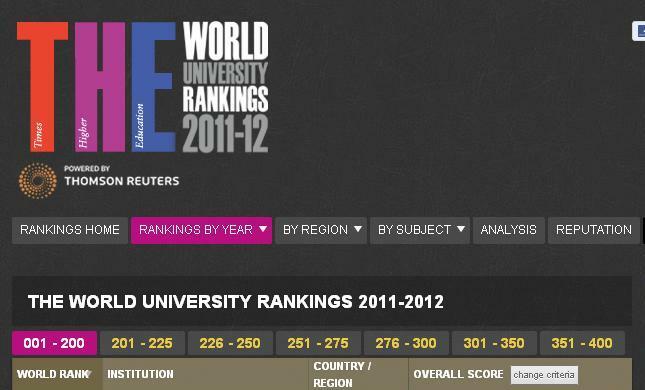 This comes a month after a similar report released by Quacquarelli Symonds, another education organization also based in the United Kingdom, showed that the two Philippine universities which made it to last year’s top 300 list – Ateneo de Manila University and the University of the Philippines – fell sharply from their previous rankings. The year’s top five universities are the following: California Institute of Technology, Harvard University, Stanford University, Oxford University, and Princeton University. University of Cambridge, Massachusetts Institute of Technology, Imperial London College, University of Chicago, and University of California-Berkeley complete the top ten. The highest ranked Asian university is Japan’s University of Tokyo (30th) followed by University of Hong Kong (34th), National University of Singapore (40th) and China’s Peking University (49-50). There are 62 Asian universities in this year’s top 400 list. For his part, Dr. Jose Wendell Capili, Director of UP’s Office of Alumni Relations, said that similar to previous years, the state university did not participate for this year’s survey. He added that UP may join in such surveys soon, but “the decision to participate will come from UP system president Alfredo Pascual and his executive staff (the vice presidents) and chancellors like UP Diliman chancellor Caesar Saloma,” and after very hard internal and external preparations. On separate occasions the past few years, officials of higher-ranked Philippine universities have voiced reservations about these rankings for various reasons. This includes Ateneo de Manila University president Fr. Bienvenido Niebres (http://www.ateneo.edu/index.php?p=120&type=2&aid=4489), UP vice president for public affairs Cristina Pantoja-Hidalgo (http://www.up.edu.ph/features.php?i=94), and Engineer Alberto Laurito, assistant to the rector of the University of Santo Tomas (http://www.varsitarian.net/news/times_higher_education_survey_erroneous).